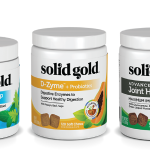 How much participation can we get from Twin Cities Solid Gold Pet Food Feeders? 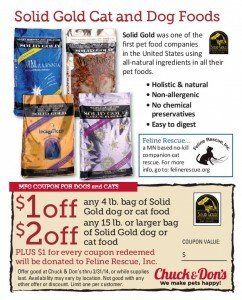 Now through March 31, 2014 – Solid Gold Northland is donating $1 for every coupon redeemed from Chuck & Don’s Pet Food Outlets Barkin’ Mews Newsletter to Feline Rescue of MN. 10’s of thousands of Twin Cities pet owners receive Chuck & Don’s quarterly Barkin’ Mews. If you received your newsletter, locate your coupon and be sure to redeem it by March 31, 2014. If you do not receive the newsletter – no problem. Stop into your nearest Chuck & Don’s store and a helpful team member can find you a newsletter and the Solid Gold coupon behind the counter + get you signed up for future newsletters. 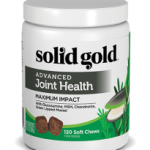 $ There is also a couple bucks savings for you and your pet $ – Must Present original newsletter coupon. Feline Rescue, Inc. is a Minnesota based no-kill companion cat rescue organization. Established in 1997 in Minneapolis, MN as a 501(c)(3) non-profit organization. Feline Rescue is an all volunteer organization, with no paid staff and they are funded exclusively through donations and grants. Feline Rescue receives no municipal, state, or federal funding. Feline Rescue provides rescue and relief to the homeless and endangered cats in our community through programs that offer shelter, foster, social and medical rehabilitation, feral and stray management, spay/neuter subsidy, and community education. Their mission is to provide safe shelter, veterinary care, and socialization for stray, abandoned, or abused cats until good permanent homes can be found for them. Our mission does not enable us to accept owner surrendered animals. Feline Rescue Adoptive Home and Foster Home needed.